Some people must like them – the houses dressed in exterior lights as if they are a Christmas tree. 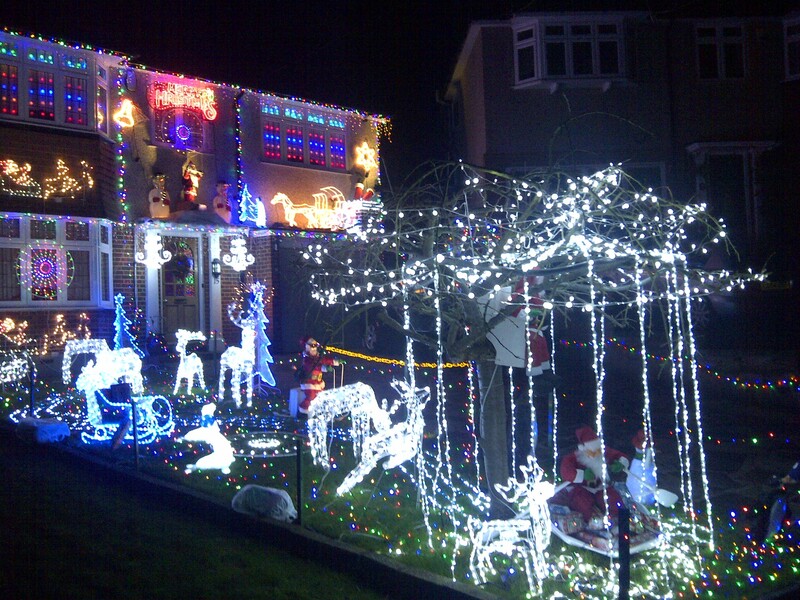 And at Pinewood Close in Shirley, they even use their festive light displays to raise money for charity. Despite the rotten pre-Christmas weather, visitor numbers to the well-lit residential street are as high as ever. The spectacular evening “show” is popular with visiting families with young children and excellent entertainment for families coping with austerity at Christmas 2013. The younger ones love the animated reindeer and Father Christmases. Collections for charity in the close just off Shirley Church Road go to children’s charities the Starlight Children’s Foundation and the Great Ormond Street Hospital. This entry was posted in Activities, Charity, Community associations, Shirley and tagged Christmas, Croydon, Great Ormond Street Hospital, London, Shirley. Bookmark the permalink.